With no children of their own, the forty-plus children who live, play, and go to school at the orphanage have become family to Mitch and his wife, Janine. Chika's arrival makes a quick impression. Brave and self-assured, even as a three-year-old, she delights the other kids and teachers. But at age five, Chika is suddenly diagnosed with something a doctor there says, "No one in Haiti can help you with." Mitch and Janine bring Chika to Detroit, hopeful that American medical care can soon return her to her homeland. Instead, Chika becomes a permanent part of their household, and their lives, as they embark on a two-year, around-the-world journey to find a cure. 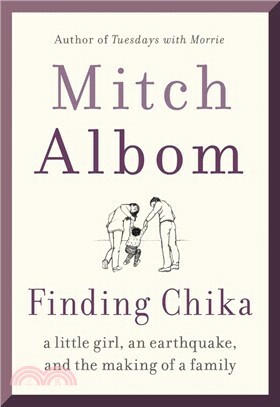 As Chika's boundless optimism and humor teach Mitch the joys of caring for a child, he learns that a relationship built on love, no matter what blows it takes, can never be lost. Told in hindsight, and through illuminating conversations with Chika herself, this is Albom at his most poignant and vulnerable. Chika is a celebration of a girl, her adoptive guardians, and the incredible bond they formed-a devastatingly beautiful portrait of what it means to be a family, regardless of how it is made.